I can remember muskie fishing a couple years ago with my brother in law. We were fishing down a shoreline and moved to a part of the lake where I’d never even seen a muskie before. I was wondering how much longer I should wait before asking him if he wanted to move on to a new location. 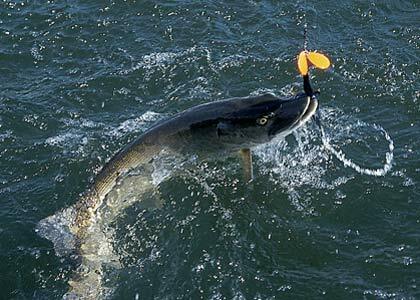 Suddenly he encountered a viscious strike, and shortly after landed a fat 38″ muskie. Sometimes you think you know where the fish will be, but you never really know you so you’ve got to check. This week I got an email from one of our vendors. The vendor was reminding me that I had declined some of their maintenance script for their database. I didn’t see the need for their script as I run maintenance over all the databases on the instance at the same time. I update statistics and rebuild/reorganize indexes based on fragmentation levels and page counts. Their maintenance also included a file shrink, which is usually a waste of resources – size it out correctly the first time! Anyway, I responded that the software was performing fine and my maintenance plan was covering everything that theirs would have. Then, just for kicks and giggles, I decided to check out the fragmentaton on the database in question. It is a small database and only 6 tables are over 1000 pages anyway, so fragmentation probably wouldn’t ever cause a noticable performance impact, but I was surprised to see some pretty high numbers. I went to my defragmentation log and could not find a record of any of those tables being defragmented in the recent past. I went in and checked the SQL Agent job and found it was running as expected. Then I found the issue – the stored procedure I use to loop through the tables and defragment takes a @databases parameter that can be filled in if you only want to defragment select databases. Since there were a few I wanted to skip, I put all the others in, but the parameter was defined as varchar(128), which was woefully short. The defragmentation routine was only getting the first several databases that I had specified, and the others were not being touched. I quickly corrected this by extending the parameter to varchar(4000) and ran it (overnight) to catch up. Now I can see fragmentation is down where it should be. The lesson in this story is to check and double check. As a DBA you can never be too careful, and you don’t ever really know something unless you can prove it by looking at the raw data.